QFD: The world is a tragedy to those who feel, but a comedy to those who think. NGSS : HS 3-2 Make and defend a claim based on evidence that inheritable genetic variations may result from: (1) new genetic combinations through meiosis, (2) viable errors occurring during replication, and/or (3) mutations caused by environmental factors. QFD: I was brought up to believe that how I saw myself was more important than how others saw me. this weeks learning object : NGSS : HS 3-2 Make and defend a claim based on evidence that inheritable genetic variations may result from: (1) new genetic combinations through meiosis, (2) viable errors occurring during replication, and/or (3) mutations caused by environmental factors. Essential question of the day : what causes albinism ? QFD: Everything has got a moral if you can only find it. QFD: Don’t confuse being ‘soft’ with seeing the other guy’s point of view. Essential question of the day : what does a mutation look like ? QFD: A loving person lives in a loving world. A hostile person lives in a hostile world. Everyone you meet is your mirror. Essential question of the day : describe a somatic mutation and how it differs from a germline mutations? Essential Question of the Day: did you study for the final? QFD : Nothing says holidays, like a cheese log. QFD : I learned from my grandmother, who grew up in devastating war times, how important it is to keep with tradition and celebrate the holidays during tough times. Essential question of the Day: what does the structure of DNA actually look like ? What do the parts represent ? QFD : Holidays are all different depending on the company and time of your life. Essential question of the Day: what role does DNA play in creating proteins? QFD: Every single thing that has ever happened in your life is preparing you for a moment that is yet to come. This weeks learning objective:NGSS LS 1-5 Use a model to illustrate how photosynthesis transforms light energy into stored chemical energy. HS-LS-1-4 Use a model to illustrate the role of cellular division (mitosis) and differentiation in producing and maintaining complex organisms. Today’s performance objective : students will know and be able to explain why Mutations in genes that control mitosis may cause uncontrolled cell division which leads to cancer. QFD: Someone else doesn’t have to be wrong for you to be right. Essential question of the day : How do plants evolve over time? This weeks learning objective: NGSS LS 1-5 Use a model to illustrate how photosynthesis transforms light energy into stored chemical energy. HS-LS-1-4 Use a model to illustrate the role of cellular division (mitosis) and differentiation in producing and maintaining complex organisms. THis week’s learning objective : HS – LS 1-4 Use a model to illustrate the role of cellular division (mitosis) and differentiation in producing and maintaining complex organisms. 1. In your journal, draw a chromosome and indicate the location of a gene on the chromosome. 2. Skin cells are constantly being shed. How does your body replace these lost cells? 3. How are genes passed on from the cell of a father to his son? 4. How are many specialized cells in the human body generated from one fertilized egg? Essential question : Hypothesize which obstacles a cell must overcome in order to produce another cell. A multicellular organism that is diploid (2n) develops gametes (egg or sperm cells) that are haploid (n). Fertilization occurs when an egg and a sperm cell (n + n) join to produce a zygote (2n). The cells of the zygote divide through the process of mitosis and they differentiate to form various parts of the body. Mitosis continues to promote growth and development. A multicellular organism is produced that is diploid (2n). QFD: No matter how many mistakes you make or how slow you progress, you are still way ahead of everyone who isn’t trying. Essential question of the day : What evidence is there to suggest that the organic compounds produced by plants are the primary source of energy and nutrients for most living things? QFD: Life is 10% of what happens to you and 90% of how you react to it. Essential question of the day : How are the processes of photosynthesis and cellular respiration interrelated? Today’s performance objective : students will know and be able to demonstrate an understanding of How living things accomplish life functions by taking the district performance test . 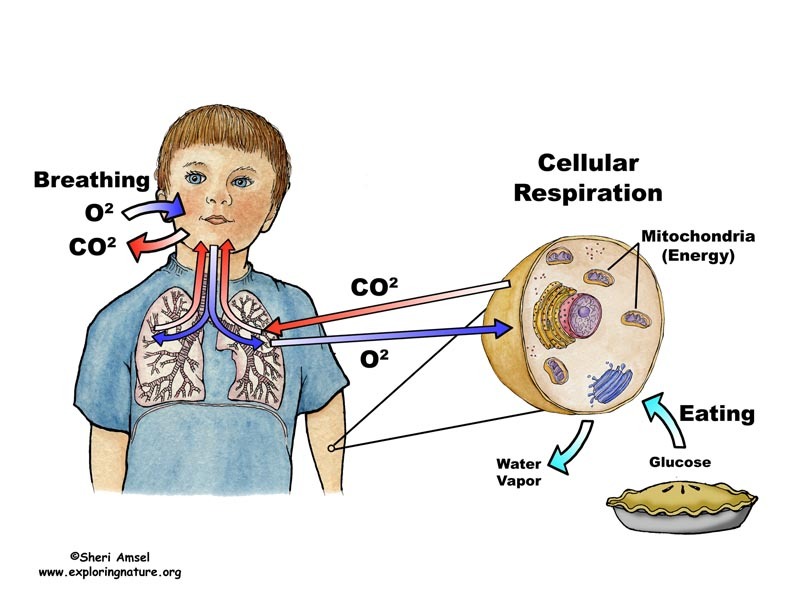 Essential Question of the Day: How does an animal respirate ? What organ systems and organs are involved in this process ? Which molecules are necessary for cellular respiration to take place? NGSS 1-6 Students who demonstrate understanding can construct and revise an explanation based on evidence for how carbon, hydrogen, and oxygen from sugar molecules may combine with other elements to form amino acids and/or other large carbon-based molecules. as demonstrated by investigating, creating and building a biome to house a plant and animal for 21 days. This weeks learning objective: NGSS LS 1-6 Students who demonstrate understanding can construct and revise an explanation based on evidence for how carbon, hydrogen, and oxygen from sugar molecules may combine with other elements to form amino acids and/or other large carbon-based molecules. This weeks learning objective: NGSS 1-6 Students who demonstrate understanding can construct and revise an explanation based on evidence for how carbon, hydrogen, and oxygen from sugar molecules may combine with other elements to form amino acids and/or other large carbon-based molecules. Essential Question of the Day: How do living things carry out life processes? Essential Question of the Day: How do cells transform, store, and use energy to maintain the survival of organisms? Essential Question of the Day: How are the light independent cycle and the Calvin cycle different? How are they similar? Essential Question of the Day: Analyze why leaves change in Autumn? Today’s learning objective:HS LS 1-5 students will be able to Use a model to illustrate how photosynthesis transforms light energy into stored chemical energy. Today’s learning objective: HS LS 1-5 students will be able to Use a model to illustrate how photosynthesis transforms light energy into stored chemical energy. Essential Question if the Day: Analyze how plants obtain the energy to grow ? Essential Question if the Day: what is the formula for cellular respiration? QFD: What we think, we become. * Multicellular organisms have a hierarchical structural organization, in which any one system is made up of numerous parts and is itself a component of the next level. 1) Homeostasis is something that all organisms, whether they are a rat, human, or cactus, need to have. What is homeostasis and how do the organ systems help the body maintain it? In your response, include 3 examples of how the organ systems contribute to homeostasis in the body. 3) In order to grow and develop, a rat would need nutrients and water. Where does it get these and how does every cell get what they need? 4) Name an organ that can be considered part of more than one body system. Explain its roles in each body system that it belongs to (one organ in at least 2 different systems). QFD: There are only two ways to live your life.